A large service area compromising of several buildings. The site was built on the Oswestry Bypass to replace facilities in Whittington which had lost its traffic to the new A5. It was the Oswestry branch of Little ChefHistory, which gained a Burger King. It was built with a large tourist information centre, with a spire making it look like a supermarket of the time. 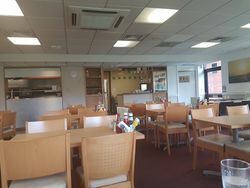 In 2001 the restaurant became a Little Chef Choices which saw it gain a Harry Ramsden's, Upper Crust and Caffe Ritazza. Those were later removed, but Coffee Tempo! was added. Euro Garages acquired the forecourt and began adding their own catering facilities, providing a wide range of choice here. 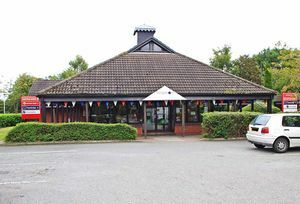 In 2017 the Little Chef was then also acquired by Euro Garages, and later became EG Diner. The EG Diner closed for the final time on the 28 October 2018.